Epic (pro E-piK) -An extended narrative poem in elevated or dignified language, celebrating the feats of a legendary or traditional hero. Epic (pro E-piK) - An overblown CGI battle sequence or sequences, slow-motion close-ups on leads, music traditionally by Hans Zimmer, minimal plot. Of all the literary epics - in the truest sense of the word - Homer's The Iliad has to rate as one of the all time greats. Anyone who's immediately trying to remember which episode of The Simpsons I'm talking about should leave now. The story of the King of Kings, Agememnon, and his lust for power, and of Trojan prince Paris and his stealing of Agamemnons' brother's wife, Helen, and the war that ensues from this event has long endured. Legendary heroes Achillies and Hector's names still reverberate even to this day, some three thousand years after the events they took part in. So, surely in this day and age of movie making, where grandiose glorious heroes, heroic feats and huge, sweeping storylines are regularly being made and applauded, Wolfgang Petersen's movie of The Illiad, Troy, should fill the gap left by other epics like the Lord of the Rings trilogy. The story, in case you're not well-versed with Greek poetry, is that of Agamemnon (played with slimy gusto by Brian Cox), the King of Kings, who ruled most of the kingdoms surrounding the Aegean Sea some three thousand years ago. The keys to his power were the huge armies of other kingdoms that he commanded, and the legendary warrior Achillies (Brad Pitt), the greatest warrior who ever lived. Achillies, though, is a warrior who's in it for the glory, not for any particular allegiance, and he openly detests Agamemnon. Agamemnon lusts after power. The one empire that has yet to fall is the Trojan empire, protected by the supposedly-impenetrable wall that surrounds the main city of Troy. When Menelaus, Agamemnon's brother, has his wife, Helen, stolen away by Trojan Prince Paris (Orlando Bloom), Agamemnon uses this event as an excuse to wage war on Troy, while the Trojans, lead by warrior Hector (Eric Bana), prepare for the impending onslaught. This brief synopsis alone is enough to tick every box under the heading Epic: Huge armies colliding? Check! Noble heroes who will die for the love of a good woman? Check! Evil conniving rulers who have no honour?. Check! Everything is, in a word, BIG! So... the fact that the movie is insanely dull has to raise an eyebrow or two. The director seems to know what will work on paper, but cannot seem to grasp how to translate the words to screen. In theory, having fifty thousand men on either side colliding in a massive melee as the camera pans lovingly over the immense action tableaux sounds like a shot that simply can't fail to impress with its sheer breathtaking visual audacity, but when you see it on screen you realise the difference between these moments in Troy and similar moments in The Two Towers or The Last Samurai. The difference is emotional depth. Both the previously mentioned films had carefully crafted characters, with real reasons for being in the situation that they found themselves in. These were heroes audience could empathise and root for, but with Troy, every character, barring Eric Bana's Hector, is wholly unsympathetic, and in most cases stupid as all hell. Of course, you have to accept that the times in which the story takes place gives most of the characters some leeway, especially when every second line is an exclamation of "By the Gods!" 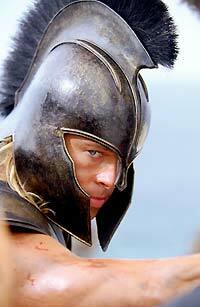 or "The Gods favour us..."
Troy doesn't give any background to the characters. Instead of taking time to build emotional ties to the characters, and giving the audience a basis to accept this kind of bluff talk, Petersen seems to want to dive straight in with the CG war stuff, and let the actors do what's required to flesh out any character traits that the meagre script provides. This poison chalice serves Bana well. He works really well as Hector, a man perhaps before his time, who works on strategy, while the religious factions base battle plans on crows flying overhead holding snakes, or any other omen they can deem from their surroundings. Sadly his nemesis, Pitt's Achilles, has been devolved from the Demigod force of nature in Homer's stories to a brainless lunk whose only motive for anything is to have people recount his stories in a thousand years time. Other characters, such as Sean Bean's Odysseus, who could effortlessly command whole swathes of film time are poorly served by a weak script and endless battle scenes. Orlando Bloom's Paris, who starts the war in the first place, is a coward by nature. He, too, is underused, except for a final dénouement, and by the time it arrives, you will find yourself past caring. The camerawork is clearly lavish, and tries very hard to make everything epic, but again, like so much else in the film, it does what it says on the tin, but feels remarkably soulless and manipulative. It gives each and every one of the bronzed - and, in Diane Kruger's case, impossibly beautiful - cast their soft focus slow motion moment in the sun to make you realise just how heroic / legendary these characters are. Each time the movie begins one of its many, many moments of conflict, it is filmed as a glorious sweeping shot, but then quickly becomes confused, and gives you no idea of exactly what is going on. This removes you from the action, and leaves you waiting to see a face that you recognise in the fight to help you intepret the battle. And that is the crux of the matter. For all the CG battle glory, Troy fails to engage on every level. I continually bring up the CG battles, but the reason for this is simple: they make up the majority of the film.... Greeks arrive, fight Trojans, Trojans fall back, Trojans fight back, Greeks fall back, Greeks fight back, Trojans fall back, etc, etc, etc ad nauseam. The battles are so huge in both running time and scale that a number of unintentional laughs are caused by the situations, such as a single warrior being killed by Hector, who suddenly calls the battle off with the whispered line "enough killing for one day", which would work if the army was the twenty men surrounding him at the time, but when you're aware that the fight is stretched over ten miles of beach, with millions of men on either side fighting, it becomes ridiculous. As mentioned before, you suddenly realise that the reason the battles in The Two Towers worked was because there was a well crafted film between the fights. By the end of Troy you honestly can't say the same. After a similarly-epic running time of two hours and forty odd minutes you would hope you could remember something other than just a swarm of little men hitting a similar swarm of little men, but, alas, no. Troy could have been a fantastic film; a combination of Gladiator's sword and sandals historical epic storytelling and Return of the King-style battles, but in the end the only thing it leaves you with is a nagging feeling that it all could have been so much better if it had not tried to be epic, in any sense of the word, and just tried to be another word beginning with e. Entertaining.